Oscar Yeadon recently caught up with Alec Head to look back on his remarkable career as jockey, trainer and breeder, and his part in the enduring Head training dynasty and development of the thoroughbred pedigree in Europe. Your grandfather William Head Sr. was a steeplechase jockey in Britain before moving to France in the 1870s and later established the training business that you ultimately became part of. Did you ever have an ambition to have a career outside of racing? What was your first involvement in racing? 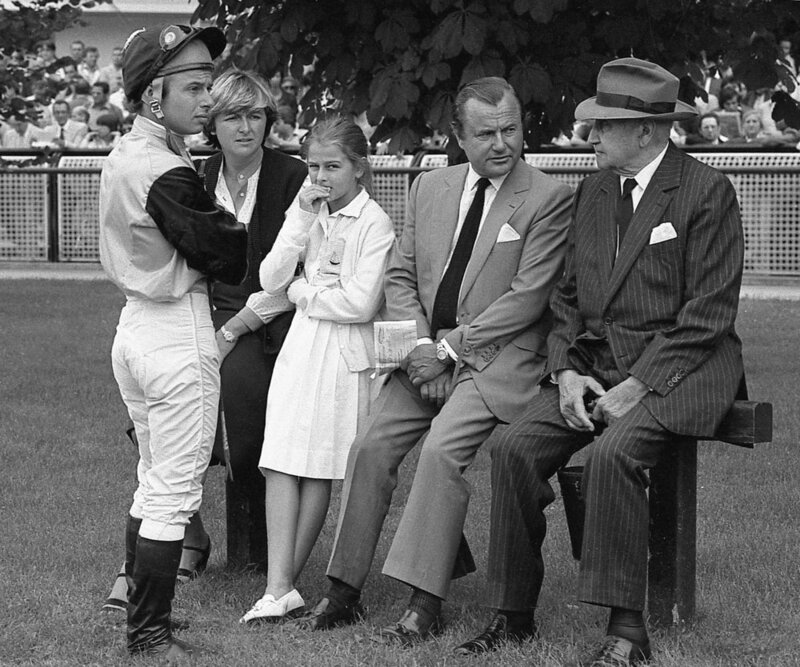 Alec Head (second right) with father, William (right), grand-daughter Patricia, Criquette and Freddy (in the family colours), 1982. “It was around 1942, when I started race riding. I won the big race over jumps at Auteuil, and was riding on the Flat as well, but got too heavy. We raced through the war and it was tough, and I used to bicycle everywhere. The Germans would go to the races as well, so racing continued but a lot of the courses were shut, so they organised Flat and Jumps meetings at the few that were open, such as Auteuil and Maisons-Laffitte. “Racing recovered fairly quickly after the war and I stopped riding towards the end of the decade, because I was by then married and my wife Ghislaine said I should stop! “So I started training and had always planned to do so - what else could I do? We had very few horses, but the business grew organically by winning races. I had some luck in sending horses to Italy, who won their races there, which attracted some Italian owners, who then sent me horses, including Nuccio. And Nuccio was your big break? Treve was bred at Haras du Quesnay, which has been home to your breeding operation for sixty years. How did it start? “About 10 years into my training career, I was looking for a stud as I love breeding. The stud had not been in use for many years and was not very well known, but I knew the guy who was dealing with Mrs Macomber [the widow of A Kingsley Macomber, who had owned a Preakness winner and also won the Prix de l’Arc de Triomphe with Parth]. As a breeder, you have been widely acknowledged as a major influence by bringing American bloodlines to Europe. What are your memories of that period? “The US bloodlines were doing well and we went to Keeneland and were lucky to buy the likes of Riverman, Lyphard and many others. We would later sell some back to the US, for which we received some criticism as some of the stallions were syndicated and the shareholders liked the money to spend on other stuff! What are your thoughts on the recent moves by the European Pattern Committee to enhance the stayers’ programme? Do you think it’s harder or easier for the trainers of today to forge a successful career? “I really don’t think there’s any difference between then and now. Gosden, de Royer-Dupre and others, are all 70-year-olds, or so, and they’re still at the top. “At my peak, I had around 120 horses and, later in my career, only trained for Pierre Wertheimer and the Aga Khan. They were top breeders and it was wonderful. Mr Wertheimer gave me the money to buy horses from all over the world. I wouldn’t say I was a pioneer; I was very lucky! “I think maybe it’s harder for younger trainers today, as the bigger owners have mostly disappeared, but it was hard in our time, too! Of the trainers who were contemporaries of yours, who stands out? Is there anything that you would change about racing today? And what do you feel was your greatest achievement?